The retail market demands now more than ever to stay close to our customers, and to carefully understand what services, products, and wishes are relevant for each customer at any given time. This sort of marketing research is often beyond the capacity of traditional BI reporting frameworks. In this talk, we illustrate how we team up data scientists and big data engineers in order to create and scale distributed analyses on a big data platform. Big Data is important but speed and the capacity of the system of reacting in a timely fashion is becoming also increasingly important. Which components and tools can help us creating a big data platform which is also fast enough to keep up with the events affecting the customers' behaviour? When the marketing goes from push to ask (permission marketing), it's the user the one who grants the interaction. Permission marketing is the user's grant of being heard. In order to be effective and lead to conversions, it's important to provide the right suggestions, at the right time. This is largely determined by the user's context when the interaction happens. The given users' context is increasing in size and complexity. Thanks to the cluster computing power, what could be done once a month on a single server, can be done now everyday. However this does not take into account the user's recent events fast path in the analysis. Hadoop, currently can operate on 100's of terabytes of data, but it requires time to process this information and this big data slow path does not match the latency of responsive/reactive web applications and APIs. 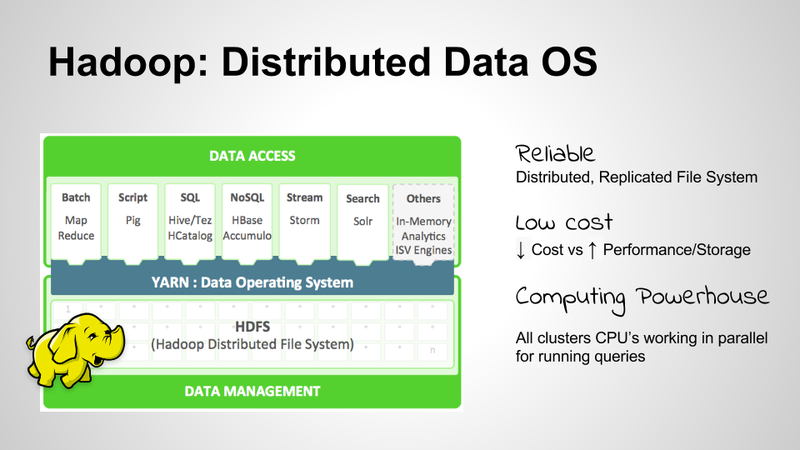 Advantages: it scales horizontally (can run in cluster mode), it makes maximum use of the avaliable cores/memory, the processing is non-blocking, thread is re-used if computation cannot proceed because of I/O of other blocking operations, the computation can be parallelized across many actors and therefore reduce the overall latency of the system. How to connect the two systems: Cassandra as a distributed memory key value store. Why? it's a low latency data store the system is resiliant, with no single points of failure and distributed across multiple nodes and data center for high availability Cassandra can be used as a "latency impedance" between the fast path and the slow path. 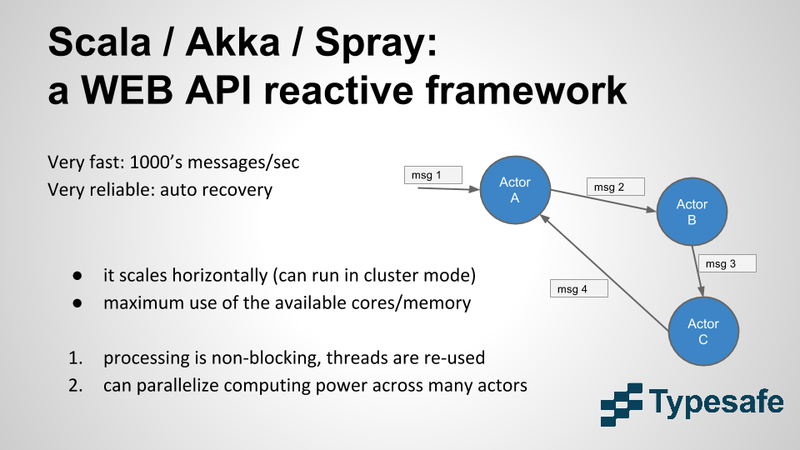 This sort of architecture is often referred in the literature as the lambda architecture (although the original version proposed by Natahn Marz refer to the combination hadoop / storm, while here I am describing a system based on hadoop / cassandra / akka). 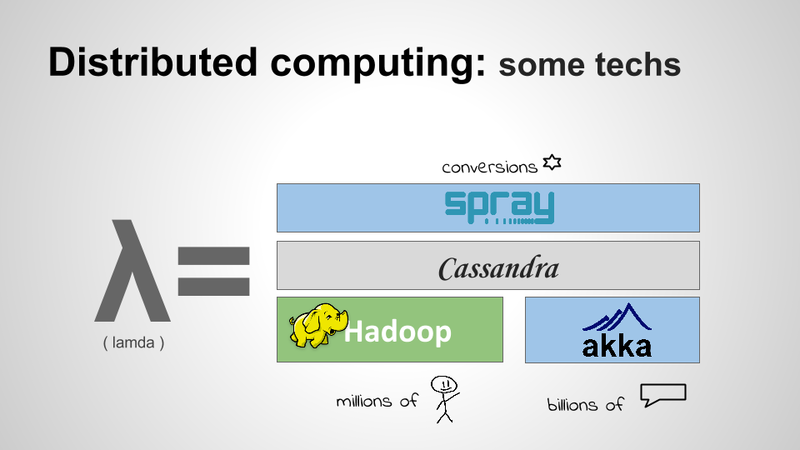 Cassandra can be used to store models parameters, preliminary results from hadoop, as well as fast data and events.